It was just a super winters day for flying. Warm and sunny with light winds. Doesn’t get much better than that. It was possibly the best Sunday we’ve had since Easter. 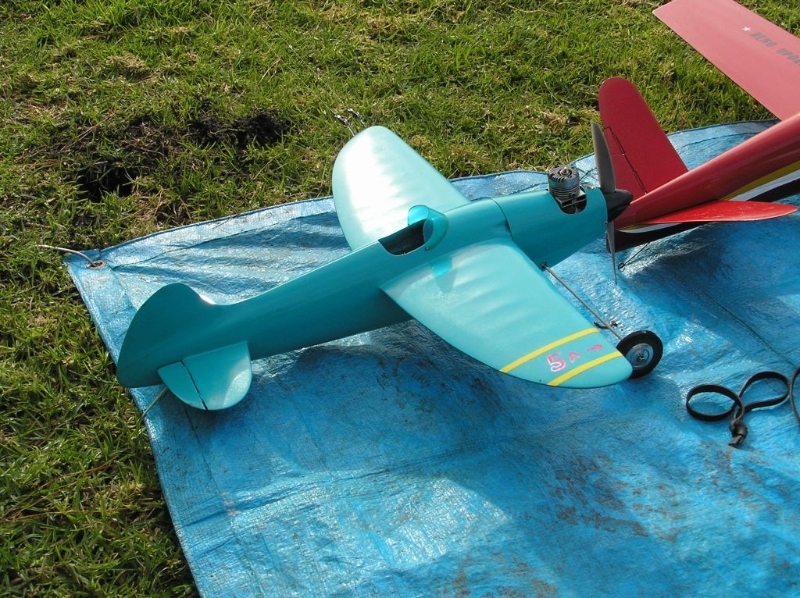 It was just a club event, so a bit of swapping pilots and pitmen was fine. As always, these club events provide good racing practice for some major events later in the year. Classic B was first up and provided the usual close racing. A variety of engines were at the field including OSFX, Enya, Irvine, Brodak, GMS and ASP. Vintage A was a low key event with both Harry Bailey and Ken Hunting breaking the Dimpled Dumpling/R250 mould by using second string CS Olivers in an Olympian and a Tarantula. In pre-race practice John Hallowell and Andrew Nugent had the Elliptical in the mid 21’s for 42 laps but John had to go early so they did not race. Andrew then used Mark Ellin’s R250 in his new DD but could not do better than mid 3.20’s. Murray and Neil again showed how fast the pink and black DD is with an easy FTD 3.15. No final was run in Vintage A. Classic B was first up and provided the usual super close racing. In the heats, only 1.94 seconds separated the top three qualifiers! A variety of engines were at the field including OSFX, Enya, Irvine, Brodak, GMS and ASP. It was great to see some new faces in the circle. Gavan Opperman was racing with his Galaxie for the first time and did extremely well. In his heat against current World Champ Mark Ellins, Gavan was first away. Both pitmen were flicking Brodak B25Rs. Gavan’s best time of 3.12 is an excellent start. Adam Kobalt and Matt Bready were flying the old Murray Wilson Galaxie. This model was not quite on the pace this time with a best of 3.21 but was a Nats winner in January 2009 when the late Lance Smith was flying with Murray. Lance’s memory survives as his modified engines continue to dominate this racing class. Graeme Wilson and Mark Ellins had a rich run on the first tank of their first heat but then needled in to record a 3.11.84 in the second heat. However, the winners of January’s CLAMF Grand Prix were not quick enough to make the final at this meet. Paul Stein had both the Willows in his corner and tuned the Enya 25 so it was on song for a 3.04.75 heat. Harry Bailey and Peter Roberts just pipped that time with a blistering 3.03.47. John Hallowell and Murray Wilson had a wrong needle in the Irvine in the first heat and quickly swapped to the OS FX Streak for the second heat. The Streak did the job with a FTD 3.02.81. The final of Classic B was a beauty with all models evenly matched for speed. Graeme’s landings were fast and Paul’s restarts were a blur. I was later told that one stop was timed at less than12 seconds. That’s motor cut, landing, refuel, battery in, restart, battery out, take-off and up to speed. Real Formula One stuff! However, the Enya wasn’t doing 50 laps for a 2 stop race and the OS FX was… and there was the vital difference. So with Harry and Peter pushing the others all the way, it was John and Murray with Oppy doing a top job on battery, who crossed the line first in 5.53.12, the second fasted time ever for a Classic B final. No surprise to learn that Rob Fitzgerald and Paul Stein own the best time, an amazing 5.49 .40 at the 2010 Vic. State Champs. Sunny and calm conditions greeted competitors for the scheduled July competition. 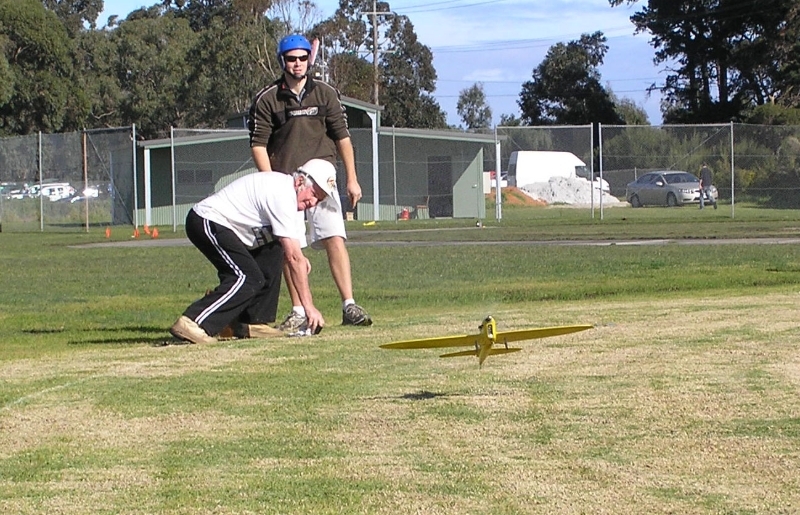 Speed, Vintage Stunt and 1/2A combat a were all flown and well supported.